These paddles are 7 ply maple wood, very strong and will not warp. Each racquet handle includes a cushion grip with a wrist strap. They meet the USAPA guidelines for a pickleball paddle. Paddles are 16" long and 7 3/4" wide, and weigh 11 ounces. u at all times. The set makes a great gift for friends, family, children, grand children, great grand children (yes I said it and some of you have them, congratulations) because it comes in a carrying case, with pickleballs and 2 paddles, ready to go! 100% Satisfaction Guarantee: If you are not happy for any reason you are not happy with these rackets please let us know. FAMILY OWNED BUSINESS: Wolfe is a family name and we put our family name on every paddle, so you can believe we stand behind our product. TOP QUALITY RACKETS: Durable 7-ply wood construction made from maple and will not warp. Handle includes a cushion grip with a wrist strap. CUSHION GRIP AND STRAP: The Pickleball Paddle handle includes a cushion grip with a wrist strap. 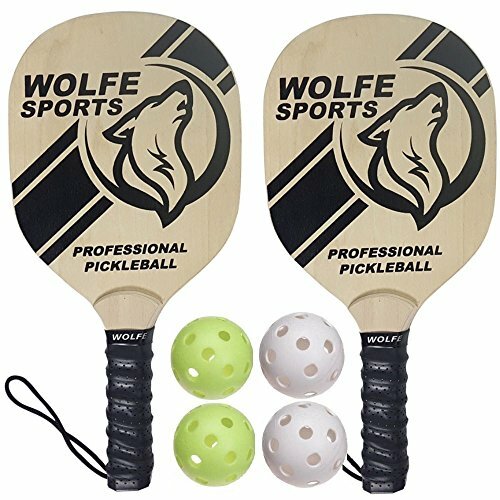 AMAZING VALUE: Set includes two (2) wooden pickleball paddles, four (4) pickleballs. A great value to start playing now! GREAT FOR BEGINNERS: Get started now with this wood paddle bundle, perfect for beginners, schools, community centers, churches, and to keep an extra set with you. 100% SATISFACTION GUARANTEE. We offer a 100% satisfaction guarantee on these racquets. If you are not happy for any reason please let us know. FAMILY OWNED BUSINESS: We take pride in all each and every paddle we offer. Wolfe is a family name and we put our family name on every paddle, so you can believe we stand behind our product. If you have any questions about this product by Wolfe Sports, contact us by completing and submitting the form below. If you are looking for a specif part number, please include it with your message.